Florian Ziegler flickr.com/photos/damndirty/40153024740/ Are machines friend or foe? 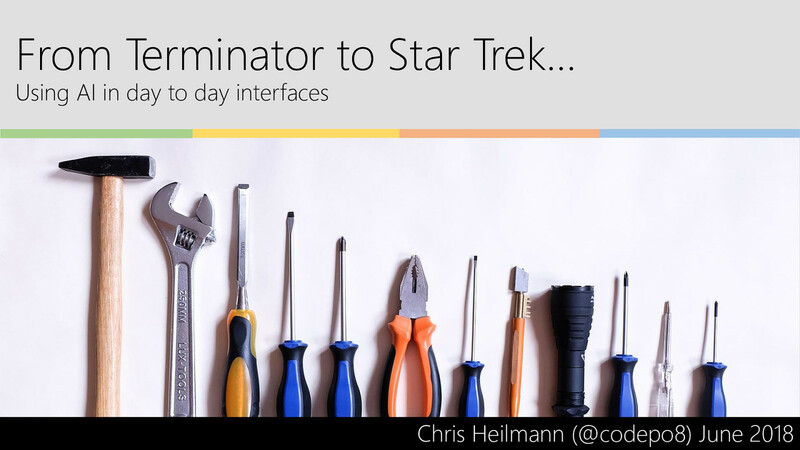 View From Terminator to Star Trek… Using AI in day to day interfaces on Notist. AI is a topic that worries and excites people. We have evidence that people get spied on with intelligent algorithms and even their political views skewed with generated news feeds. On the other hand we have over-enthusiastic press releases telling people how magic everything AI powered is. The latter is one of the main problems we have. It is time we reap the rewards of intelligent systems by creating interfaces that enable humans to do better without abusing their trust. In this keynote Chris Heilmann will show how different intelligent interfaces can make interaction easier and help make the human/machine interaction a joy instead of creepy. A list of links and resources on the topic covered.